Eugene Delgaudio Alerts President Trump About Sabatoge of Executive Order on Transgenders in Schools | Public Advocate of the U.S. Protesters last Tuesday crashed and disrupted Public Advocate president Eugene Delgaudio as he concluded a statement, in front of the White House, about the reversal of President Donald Trump's standing executive order on transgender policies in the nation's school system by out of control Obama Administrative holdovers in the Department of Education. 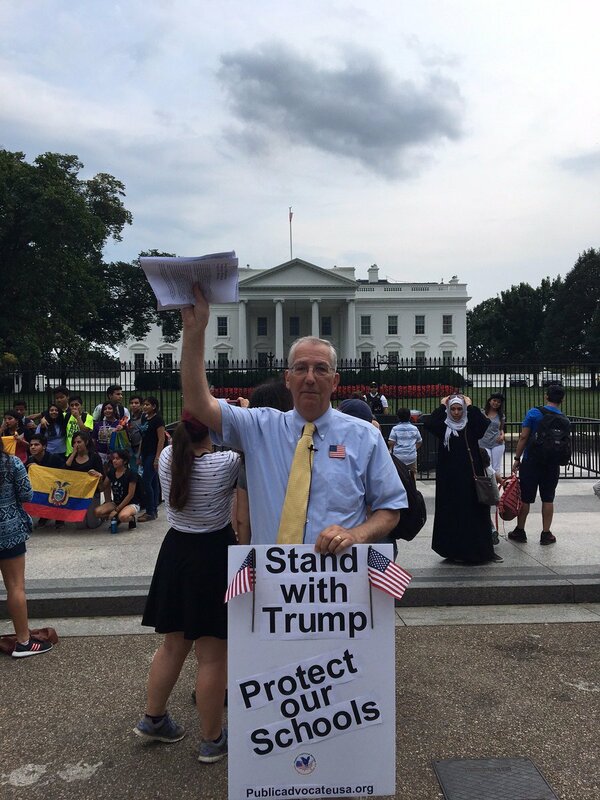 In the video recording, Delgaudio, holding a "Stand By Trump sign in his hands, was asking for President Trump to correct the intent of a "secret legal memorandum" issued earler by Education bureaucrats and demonstrators started chanting "Hey Hey Ho Ho, Donald Trump has got to go". "Mr. President, America applauds your leadership and reversals of many corrupt Obama policies that attacked America's children and their privacy through a so-called Transgender bathroom policy ordered by then president Obama. Now, today, a secrect legal memorandum seems to have been distributed without serious public notice or media scrutiny of any kind that reverses your own actions to protect millions of Christian and other morally traditional American families. Please quickly correct this sneak attack to undo your own executive order that properly restrains those who would interfere or otherwise propagandize their anti-traditional family practices on innocents, " said Delgaudio.
" Mr. President, you have been betrayed by officials within your own Administration. All of these policies contained in this Obama-era policies document are the very same policies you explicitly rejected on February 22, 2017 by choosing to withdraw the Obama DCL. Yet your Acting Assistant Secretary of Education Candice Jackson has now rejected your Administration's policies and has ordered that those very same Obama policies be put back into effect - as if your February 22 decision had never occurred! Ms. Jackson - and perhaps others working with her - have chosen to enforce the policies of former-President Obama over the policies of President Trump. Mr. President, it is not too late to put down this mutiny. Therefore, I urge you immediately to fire Acting Assistant Secretary Candice Jackson, and to demand an explanation from Education Secretary Betsy DeVos, to find out how this could have happened under her watch - or, even worse, whether it was done at her direction." Delgaudio reacted to the disruption by protestors: "Shouting me down is not going to silence me and stop me from working to support President Trump's executive order to keep men out of the school children's bathrooms, we are contacting our supporters, using social media and God willing will see a rightful correction of the renegade Education department bureaucrats," he said. Delgaudio has told 100,000 supporters of this sabotage of President Trump and is asking supporters to co-sign the letter to the president along with him to show support for Trump's policy and urging President Trump to restore his now reversed executive order on transgenders in the schools.